14.5% alc., $45. Great label. · Very shy fruit on the nose with prominent scents of oak, pine pitch and varnish. Hearty and full-flavored with copious amounts of black cherry and black raspberry essence set off by brown spice and oak. Generous and fruity rather than classy or complex. The flavors clearly trump the aromas at this stage. Good. 14.8% alc., $45. Founded by the partners of Far Niente. 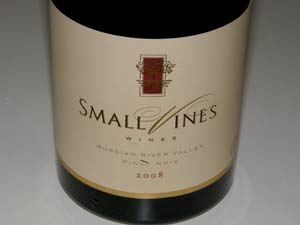 A blend of Manzana Vineyard and Graton Vineyard in Green Valley and Amber Ridge Vineyard in the Russian River Valley. Clones are Pommard 5, Dijon and heritage. Aged 11 months in 55% new and 45% once-used French oak barrels. · Medium ruby color in the glass. The nose is reluctant initially, offering more charm the following day from a previously opened and re-corked bottle. 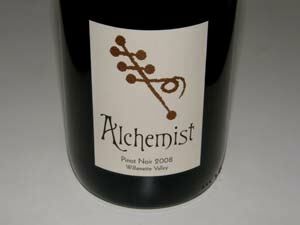 Aromas of strawberries, cherries, and spice particularly oregano. The kirsch and berry core strikes a chord with its vivid and juicy character accented by notes of baking spices, brioche and smoky oak. Admirable harmony with fine grain dusty tannins and a fruit-filled finish. Not quite up to the excellent 2007 vintage of this wine but solid. Very good. 14.3% alc., $40. · Moderately intense reddish-purple color in the glass. The nose wants for fruit, featuring instead primarily smoke and ash aromas. 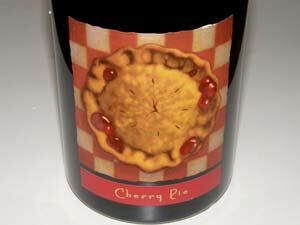 Smoky and tarry cherry flavors that are slightly tart and fail to satisfy. A disappointing wine with fruit that never really surfaces and is overshadowed by a brisk acidity. Unsatisfactory. 14.5% alc.,pH 3.63, $17 (but available for as little as $13). 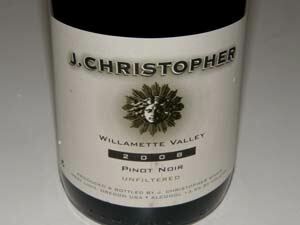 100% Pinot Noir and a blend of Pommard and Dijon clones. 100% de-stemmed, coldsoaked for 3 days, aged 9 months in 15% new French oak barrels. · Moderate ruby hue in the glass. Striking perfume of strawberries, raspberries, pear and savory spices. Tasty red, blue and black berry core with a cola and oak note. 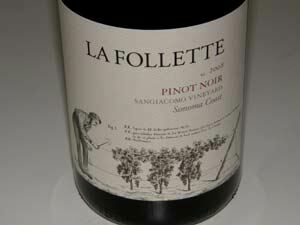 Quite smooth on the palate and will attract many fans, especially at the low price. A local retailer I know blew out cases of this wine. Will stand up to hearty fare. Very good. 14.5% alc., 461 cases, $40. From high-density plantings of 2722 to 3630 vines per acre. Dijon clones 112, 113, 114, 115, 459, 667, 777 and Swan. 6.5% whole cluster, mostly native yeast fermentation, 20 days on skins, mostly native MLF, aged 15 months on fine lees in 39% new French oak barrels, bottled unfined and unfiltered. · Demure lovely scents of Bing cherries and red raspberries with accents of spice box and sweet oak. Vibrant and fresh fruit flavors with an earthy bent, picking up interest and intensity in the glass over time. Nicely balanced t n’a and a suave mouth feel to boot. 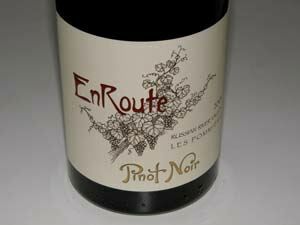 Quintessential Russian River Valley Pinot. Very good. 14.6% alc., $90. · Dark reddish-purple color in the glass. The nose is darkly fruited with heavy emphasis on oak related scents of smoke and mocha java. Thick and rich on the palate, with a generous offering of dark stone fruits, black cherries, and cassis with underpinnings of coffee and tobacco, all wrapped in soft tannins. Almost syrupy in texture and Schwarzenneggarish in heft. The oak peeks out on the dry finish. Needs time in the cellar to integrate the oak. Good. 14.5% alc., $65. Crafted from organic grapes grown at ZD’s estate vineyard in Carneros. From a 6-acre block planted to the Hanzell clone. Aged 15 months in French oak barrels. · Moderately dark reddish-purple color in the glass. Exotic and well perfumed nose of dark berries, black cherries, tea, wet leaves and floral elements. A rich, big-boned, and dense wine flush with black cherry, blackberry and black plum fruits with a subtle savory herbal note and restrained oak highlights. Very unique and individualistic with a silky smooth texture that attracts another sip. Markedly better the next day from a previously opened and re-corked bottle. I suspect this wine will be remarkable with five years of cellaring. Very good. 14.3% alc., 175 cases, $26. First Bennett Valley cuvée and the first wine from two new sources in the AVA. A blend of three vineyards. Aged 11 months in 50% new French oak barrels and 9 months in bottle. · Shy but alluring melange of berry aromas with a rose petal note. Uniquely flavored core of fresh, juicy wild berries wrapped in fine-grain tannins. The fruits has impressive persistence on the pleasing finish. Really delicious the next day from a previously opened and re-corked bottle. Very good. 14.3% alc., pH 3.65, 228 cases, $38. This winery was founded in 2007 by winemaker Steve Kirby. His background includes a successful career as a classical ballet dancer followed by a degree in enology and viticulture from University of California at Davis and fourteen years of experience crafting wine. All his wines are sourced from dry farmed vineyards because he firmly believes that dry-farmed grapes best show the uniqueness of each individual vintage. Sourced from Blue Moon Vineyard. 10% whole cluster. Natural fermentations. Aged 11 months in French oak barrels. Unfined and unfiltered. · Spend some time with this wine and you will be rewarded. Attractive perfume of sweet-scented oak-tinged dark red berry and Bing cherry fruit. Sleek and refined, with a great backbone of acidity and tannin, this fruity wine lingers with verve on the finish. Over time in the glass, the oak and tannins mellow and the fruit comes to the forefront. Even better the next day from a previously opened and re-corked bottle. A good cellar candidate that will age effortlessly. Very good. 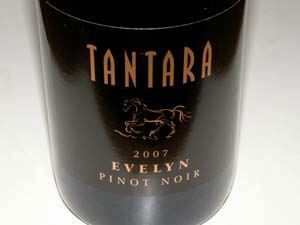 A number of impressive Pinot Noirs have been appearing in the marketplace from Bennett Valley. The appellation consists of only about 700 planted acres, but the wines from this tiny appellation are making an impression on wine aficionados. Matanzas Creek Winery, which released a Bennett Valley Pinot Noir from the 2007 vintage, its first since the 1970s, is the highest-profile producer in this region. Bennett Valley is located at the foot of Sonoma Mountain in Sonoma County approximately four miles from the Russian River Valley. It is Sonoma County's newest appellation, approved in December 2003. 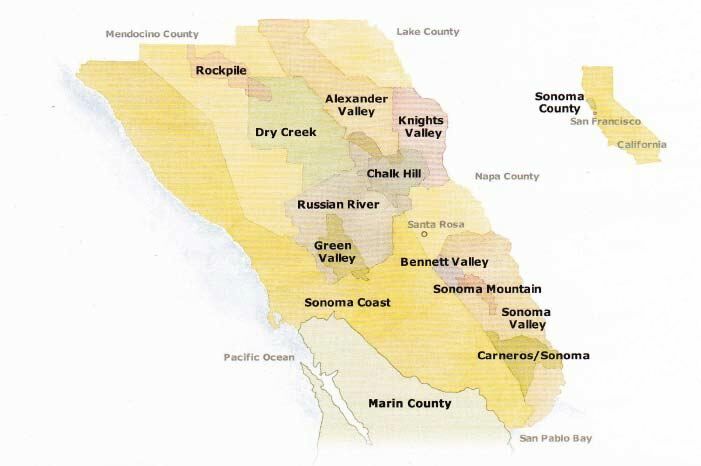 The appellation is surrounded by three mountains: Taylor Mountain to the West, Bennett Peak to the East, and Sonoma Mountain to the South (see map below). Most vineyards are planted between 500 and 600 feet elevation and enjoy a consistent marine influence throughout the growing season. The Crane Canyon/Grange Road gap in the mountains allows cooling fog and wind to enter the valley moderating summer temperatures and creating conditions that are ideal for cool climate grape varieties. The soils are mainly rocky and volcanic in origin. The Bennett Valley Grapegrowers Association (www.bvgg.org) lists 31 member growers and 8 wineries scattered among the 8,140 total acres. 66% of the planted acreage is Chardonnay and Merlot, with Pinot Noir only making up 9% of the total. 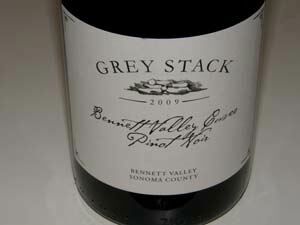 More information on Bennett Valley available on the Grey Stack Cellars website at www.greystackcellars.com. 14.1% alc., $25. Sourced from La Colina Vineyard in the Dundee Hills. 18 day fermentation, 20% whole cluster, aged 12 months in 25% new French oak barrels. Produced by Union Wine Company. · Moderately dark reddish-purple color in the glass. Opens reluctantly to reveal lovely scents of fresh berries, sap and old wood. Full-bodied but lithe and silky, with an array of berry, black cherry and cassis fruits touched by oak and accented by an appealing earthiness. Still youthful. Better the next day from a previously opened and re-corked bottle. Very good. 13.0% alc., $25. 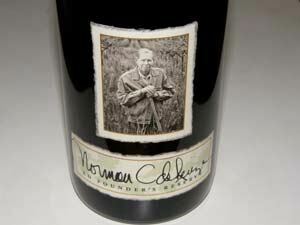 An Oregon certified sustainable wine. · Medium reddish-purple hue in the glass. Pleasing aromas of spiced berry compote, chocolate toffee and mocha java. 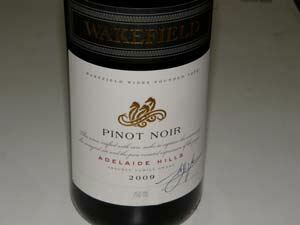 Tasty moderately rich dark berry and plum core with a subtle oak accent of coffee and dried herbs. Enough power to satisfy now, but withholding some of its charms. Better the following day from a previously opened and re-corked bottle indicating further bottle aging will be beneficial. Good. 13.5% alc., $29. · Aromas of spiced cherries, coffee and oak. Well-oaked red and purple fruits with undertones of tea and mocha. Crisp acidity with notable firm tannins. Drinks better over time in the glass and should improve with time in the cellar. Decent. 13.5% alc., $32. · Moderately dark ruby color in the glass. 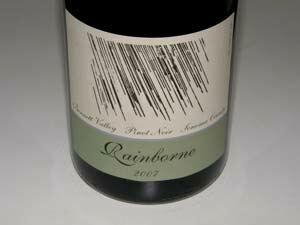 A fruity nose redolent with bright dark red berries and cherries with a hint of pine needle and spice. Delicious essence of black raspberries and black cherries enveloped in gossamer tannins. Reasonably pleasing and refreshing although on the lighter side. Beautifully composed with well-integrated oak and a soft, dreamy texture. A straightforward, solid wine that is drinkable now. Good. 13.5% alc., $40. 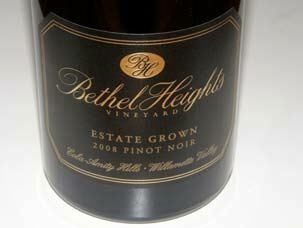 From an estate vineyard in the Yamhill-Carlton District planted in volcanic and sedimentary soils. · Darkly colored. Brooding aromas of black fruits with hints of brioche and toasty oak. 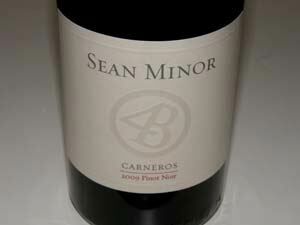 A polished, refined and sophisticated offering with plenty of earthy black fruits and a healthy tannic backbone. Monolithic and closed now, but gets better over time in the glass. Very soft in the mouth with oak playing a supporting role in the background. 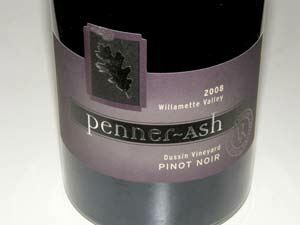 Like many 2008 premium wines from Oregon, this one needs a few years in the cellar. Should turn out to be spectacular. Very good. 14.0% alc., pH 3.55, $17, screw cap. Imported by American Wine Distributors, South San Francisco, CA. This wine is part of the Estate Series wines. Wakefield was founded by Bill Taylor, Sr., in 1969 along the Wakefield River in the Clare Valley. The fruit is sourced from growers throughout the Adelaide Hills. The fruit was de-stemmed, 60% cold-soaked for 4-6 days, fermented in stainless steel, aged for up to a year in one and two-year-old French oak hogshead barrels. · Moderately dark reddish-purple color in the glass. Aromas of dark fruits, warm walnuts, pine pitch and sweet smoke. Richly endowed with dark stone fruits and plenty of firm tannin balanced by bright acidity. Tasty, but doubt if I would identify this as Pinot Noir if sampled blind. For those looking for something different at a reasonable price. Decent. 13.0% alc., $15. I reviewed the excellent book, The Wild Vine, recently (www.princeofpinot.com/article/ 943/), and was finally able to track down a bottle of Norton wine to sample. Norton is a native Virginia grape. Aged 14 months in oak. · Inky purple color in the glass. Aromas of crushed and cooked dark berries, smoke and a chemical note. Feral and peppery black fruits with a pharmaceutical taste in the background and a tangy lift of acid on the dry finish. Well-crafted and possessing an attractively smooth texture. Reminds me of Petite Sirah in heft and size of its tannic backbone. Needs hearty food. An “acquired” taste. Good.